Immortality - an easy task for us True Christians! I have it, and I am proud to be among those few who Jesus has chosen to serve under Him for Eternity. Praise Jesus. However, there is also the other kind of material immortality and longevity that our forefathers had. This is a staggering Revelation, and the secularists have ridiculed these calculations for centuries, demanding proof, although they would have the very Words of God in front of their eyes as presented in the Bible. Fortunately, by meticulous excursions into the history of modern and postmodern arts, I have been able to locate irrefutable proof of the Bible getting it right as expected. A man of God is now proven to have lived for centuries, all the time working tirelessly to guide the western civilization onto the Narrow Path of Jesus, eventually leading to the presidency of Donald Trump. This man is Vladimir Putin. Exhibit one: A Papist-Secularist painting by a Nether Landish painter called Mr. Van Eyck. 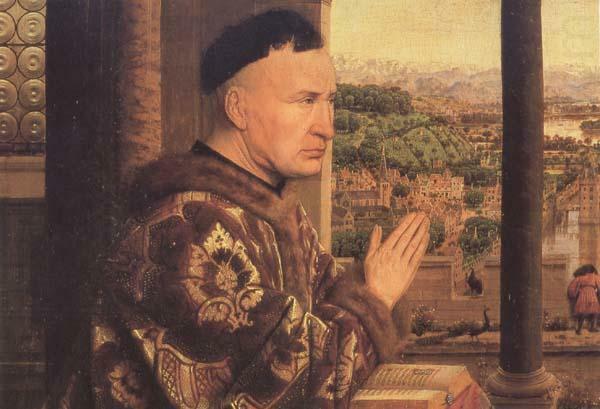 Nicolas Rolin was supposedly appointed the chancellor in 1422, at the "age" of 46, and it is claimed he served for 40 years. No-one had healthy lifespans like that in those days. The hairline is slightly receding but otherwise Mr. Putin is unchanged. Thus, it is highly likely that before assuming the identity of Rolin he would have been serving Jesus for millennia, perhaps he is of the next generation after the Flood. The name "Rolin" can easily be recognized as a cognate for "Putin" by examining the great vowel shift, the umlauts, the ablauts, the gradation, syncope, and analogy. 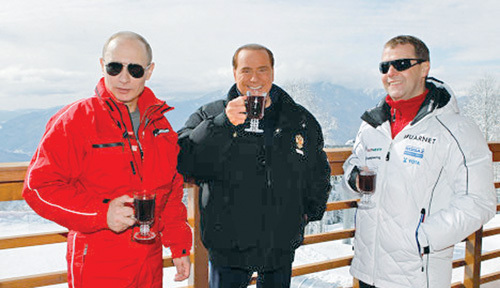 Rolin -> Rolling -> Rulin' -> Root in -> Putin. Q.E.D. Now, the only question that remains is, if Mr. Putin is just a Godly man with a genome so pure and refreshing that senescence will never catch up with him before we all experience the glorious Rapture (1 Thessalonians 4:17), or if he is an immortal messenger from God. He could very well be the angel that soon has the task of burning the Earth to punish sinners! Or perhaps he is one of the angels that will have a job with a trumpet to blow for Jesus. One thing is now clear, though. Mr. Putin has been around for centuries. He has been pivotal when America has chosen Godly Republican Presidents culminating in the events that led to the reign of Mr. Donald Trump. I urge all Brethren and intellectually capable Sisters to search for other historical images, daguerreotypes and photographs that could unravel the path of Mr. Putin across centuries and continents. The painting itself remains partly enigmatic. Why is this man dressed in red vomiting on the background? It is possible to be everliving but only the most enlightened can achieve that state. H.I.M. Haile Selassie who is Jah Rastafari is everliving. The communists say they killed him but he actually removed himself to a remote monastery in Ethiopia where he lives to this day. President Vladimir Putin is not Rastafari as far as I know so I do not know if he is everliving or not. I wonder if Brother President Vladimir still has that beautiful coat? It would make a perfectly gorgeous bathrobe - so snug during the cold Russian winters! He has, but it's been modernized. Furthermore: immediately after this thread was posted, additional data began to pour in. Mr. Putin (supposedly born in 1952 ) actually fought in both the first and the second WWs against the Nazi swarm! It is all clear now. Mr. Putin is referred to in the Gospel of Matthew! He's the one who will remain on Earth to administer Jesus's businesses until we reach Revelation 19:11. Of course, this is hypothetically bad news for Mr. Putin as he will have to remain on Earth through all the tribulations, including the venomous locusts that will torture everyone (Revelation 9:3). I am still confident that Jesus will take care of Mr. Putin's personal needs and comfort during those unpleasant years. After all that we can expect to meet Mr. Putin with us in Heaven. This is such a wonderful story! I really hope and pray that the period between 1462 and 1920 sill soon be filled with other exciting news about the adventures of Mr. Putin through the centuries! The leading atheists like Bill Gates they get blood transfusions from young children and they use the code written by God to make them repair their bodies. This is not how creation science should be used. One possibility that hasn't been considered is the possibility that Russians, like Negroes, Chinamen and some others, all look alike. There are no photos of that era, but the statue of Julius Caesar shows with no doubt that is Vlad in disguise. -He has a great experience as ruler, way before his Godly duties as Russia prime minister, acting president, president, prime minister, president again, and who knows in the future? -All the critics saying that he is "imperialist". Come on, he was Julius Caesar, he INVENTED imperialism. -The story of Julius Caesar being assesinated in the Senate: fake news. An excellent find, Brother Gonzalez. As an ex-Mexican you are a shining example of the Magical Touch of Jesus and how He can turn even the intellectually inferior Latin swarms into God-fearing True Christian™ begetters! With the 20th Century and 100-44 BC now covered, it is no surprise that Mr. Putin in popping up in many other eras and geographical locations. He spent the 19th century in Grease as General Valtinos Thanassoulas (1802-1870), apparently fighting off the Turkic Muslim swarm for Jesus! Isn't it fascinating that a man of such stature is always able to infiltrate the highest levels of any society? I am by now quite certain that we shall never meet Mr. Putin as a janitor of the Versailles, a common peasant of 13th century Italy or as a Norse longboat slave in Greenland. No, he has always been a leading force in world history. Now. The big one. Mr. Trump has also been spotted in a 700-year-old portrait! Not only a portrait but a bust! His face was was carved as a gargoyle in Southwell Minster 700 years ago! Now we have these two men and best friends who shall soon divide the world - one half for Jesus and the other half ALSO for Jesus - appearing for the first time simultaneously to guide us through these Last Desperate Times on Earth (Revelation 22:20). Are they just immortal or are they something much more: Direct Representatives of Jesus Christ on Earth! Meanwhile, the Enemy is also busy. 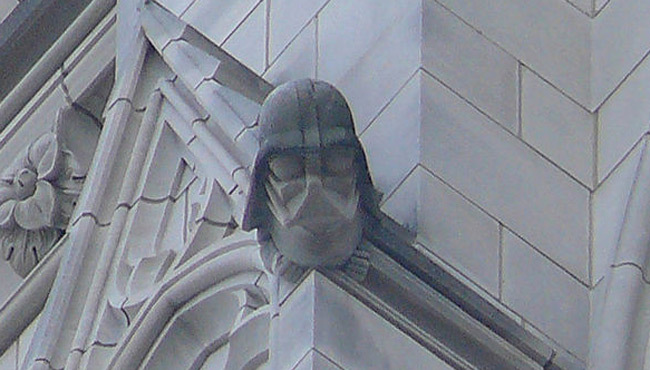 I recently discovered that in the supposedly Godly US of A the false deities of the Galactic War are depicted on the Washington National Cathedral, an Episcopal-Papist hotspot of heresy. These are interesting times. Fortunately, we know that Jesus is going to win and demolish the opposition to Him, to Mr. Putin and to The Donald (Revelation 19:21)! Thats how science work, people who are related, look similar, shocking, right?? 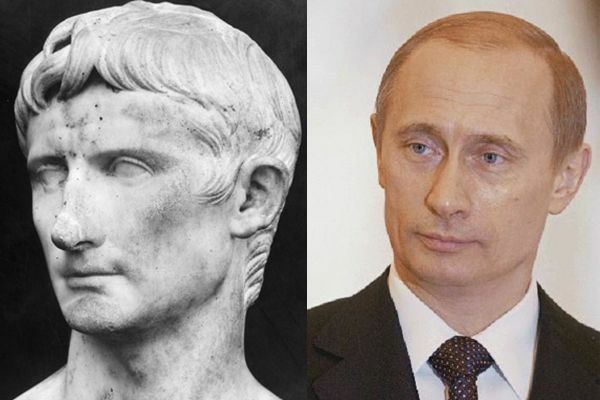 So... are you saying that while President Putin is not the same person with Valtinos Thanassoulas, Nicolas Rollin' Rolin, and Julius Caesar, he is a direct descendant of all of them? Interesting hypothesis. What's your evidence? Also, is he a very close relative (for the resemblance to show), or do all of these individuals belong to a family which has been engaged in very close inbreeding* for the last 2000 years? Just curious. * A family that sleeps together stays together? Something like that. I suppose, Sister, that Nicolas Rolin and the Greek with the unpronounceable name could both be descended from Julius Caesar, who certainly put it about a bit, if you'll pardon the rather vulgar expression, and went to both France and Greece. Could Brother President Vladimir also be descended from him? I'm ashamed to say that I know very little of his antecedents, though he is certainly of royal blood. Brother Professor Dr White's account makes more sense, though. he is certainly of royal blood. I had wondered about that often because there are other similar names and there's the explanation! Putin could simply be a contraction from Rasputin who well known scion Grigori was active at the right time. be related to Mr Rastafari? You would have to ask Mike Hezekiah about that, I think he's a pastafarian or headed in that direction, or away from it, I'm not sure. It's even possible he's about to become French. Your idea is interesting though and the attached images suggest a possible line of descent. This is a very difficult area of history with every incentive for misdirection active and applicable to all persons. Additionally if there was an infant to protect every subterfuge would be employed. 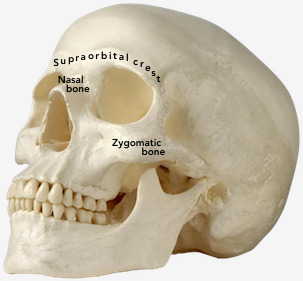 In such cases bone structure, particularly of the zygomatic bone, the supraorbital margin and the nasal bone, may be used as a guide to identification and a "negative" image brings out this salient feature very well; family resemblances are quite distinctive. 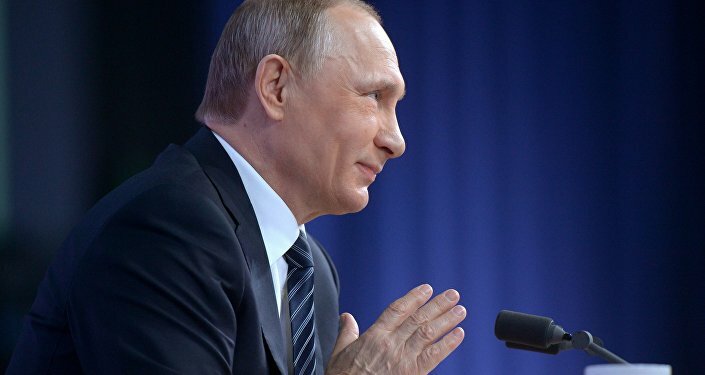 During the communist era Mr Putin suffered persecution as a believer not perhaps in the form of actual torture but in being sidelined professionally and we know how far these atheistic heathens were prepared to go in their attempts to eradicate God not only from the public square but from the hearts and minds of every Russian. But young Vladimir stood firm in his faith. Unfortunately the previously established Church was Russian Orthodox and with incessant KGB obscurantism surrounding him what a challenge it must have been to retain any belief at all. 29-31a Whom he did foreknow, he also did predestinate to be conformed to the image of his Son, that he might be the firstborn among many brethren. Moreover whom he did predestinate, them he also called: and whom he called, them he also justified: and whom he justified, them he also glorified. What shall we then say to these things? 31b If God be for us, who can be against us? Now that God's will is being sought again it can only begin from where it was left off in 1918 so abruptly on that dreadful day. As we pray for Russia's deliverance we are confident that an outpouring of His Holy Spirit shall deliver enlightenment where for so long and for so many lives there had been only darkness. From the article you linked, I noticed that Mr Putin's grandparental generation and St Petersburg are intertwined during a very turbulent period. How would an honourable man emerging from the most extreme peril in such an environment conduct his affairs thenceforth? The president’s family tree is not traced after Putin’s grandfather Spiridon Putin, who left the Tver governor for St.Petersburg at the age of 15. Vladimir Putin’s grandfather was a serious, reserved man of immaculate honesty. Spiridon Putin became a good cook. He worked in fancy restaurants in St.Petersburg before the revolution of 1917. Later, he was invited to cook for Lenin himself. When Lenin passed away, Spiridon Putin started working at one of Stalin’s dachas. Putin’s grandfather managed to survive the horrid period of the Soviet history. When he retired, he was living and cooking at a holiday camp of the Communist Party. Vladimir Putin tells about his grandfather that he was a man, who liked being silent most of his time. I'll just leave the pictures here, they are difficult to find particularly at similar ages but I'm sure you'll see what I mean. Hear my warning, unbelievers, carried to your minds by the power of the Prince of Excess himself. We have raised altars in this land so that we may sacrifice you to our gods. Veterans of ten millennia of unholy war wait to grind you beneath the treads of their mighty boots. The chosen of Khorne hunger to add you to their bloody tally. The Blood God himself has marked this land, and will claim your skulls for his throne. There is no hope in opposing the inevitable. Put down your arms, unbelievers, and bow before the forces of Chaos. I do have to admit that you're kinda cute. Can we keep you? So if we are True Christians we can be reborn to live again in this world freely. I rather die because the world is a cruel place full of people who wants to corrupt you but your so innocent you don't even know what it was until you learn and can't get that new life given by God as a special gift. I rather stay in the afterlife, If you know what I mean then its sad. ADQ, I think you're veering off into some kind of Jap Broodist syncretism with all this rebirth melancholy. This is exactly what God was talking about in Deuteronomy 7:1-4. You just can't trust some tribes to preach God's Word truthfully, no matter how you smite them. Acts 13:8 And said, O full of all subtilty and all mischief, thou child of the devil, thou enemy of all righteousness, wilt thou not cease to pervert the right ways of the Lord? It seems that Vlad has more powers than we have imagined, he can also become a dog. We could start a little game to imagine who's dog he was in his long lifetime as inmortal!